I used this month's creative kit from My Creative Scrapbook to create my second ever Project Life two-page spread (you can view the contents of this month's kit on the My Creative Scrapbook web site). 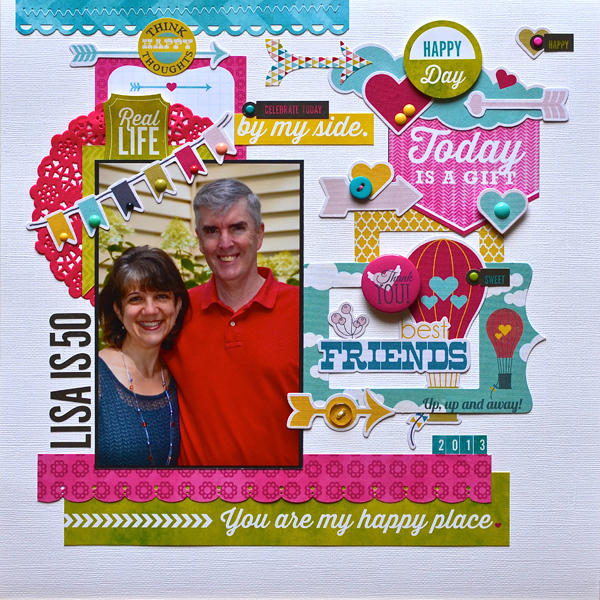 The left side is a traditional 12x12 layout and the right side uses a Becky Higgins divided page protector. Here is the right-hand page protector in more detail. 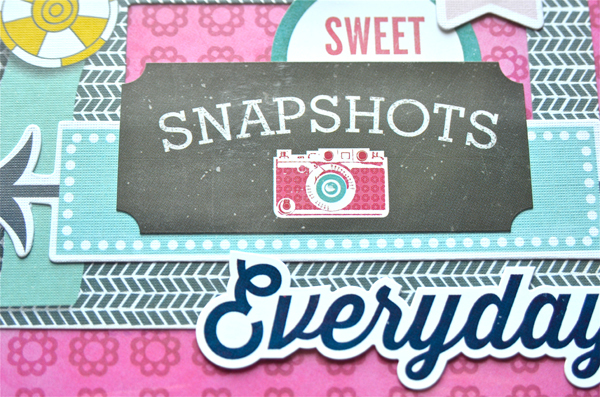 Just like with last month's Project Life spread, the embellishments are both inside, and outside, of the pockets. I'm really getting hooked on making these two-page layouts so I think you'll be seeing more of these from me in the future. I don't think I'll ever look at Project Life as a day-to-day record of our lives, but more as a companion to certain events that need a bit more space than just one page. How about you? How do you approach Project Life? This is a fun layout. Great kit for this, too. 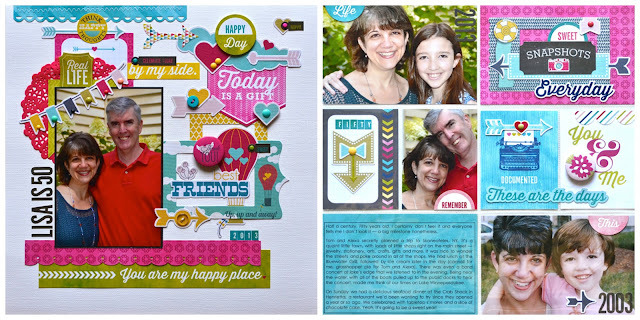 Great pages, love the balance of photos, embellishments, and journaling on your divided page! What a treat for the eyes! Great layout. Visual perfection! Love it! This is a great way to adapt PL, it's something like what I do. Great photos and a wonderful 2-page spread! I love how you are doing PL, such a great idea!! I might even be able to do it that way. Great, great pages. This is lovely! Your layouts are so colorful! Makes my eyes & soul happy! 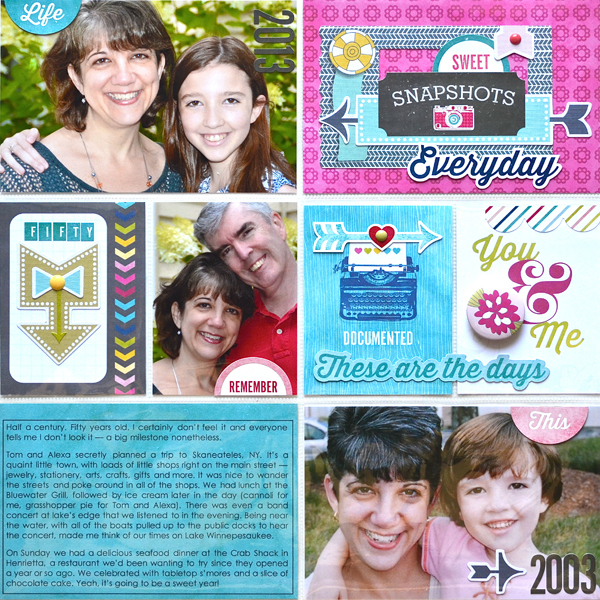 I must try the PL-style in my own scrapbooking! Thanks for sharing! What a beautiful 2 pager, way to rock out the PL and you sure don't look 50. Happy birthday! Awesome! Love the mix of PL and traditional for this spread! I love everything about these! Great mix of a page and a PL sleeve. Great layering and so fun. You absolutely do not look your age! What a wonderful layout! I love this format that you are using - a mix of traditional and PL style. Looks like a great day! love this, perfect mix of traditional and PL! Happy Belated Birthday! Absolutely awesome! I just love this idea of the PL spread for a double pager! Happy Belated Birthday! 50 looks pretty good on you. Gorgeous work girl!!! This is a GORGEOUS 2 pager!! I love love love the colors, the PL design and loveeeeeee the photos and the arrows!!! What wonderful layouts. 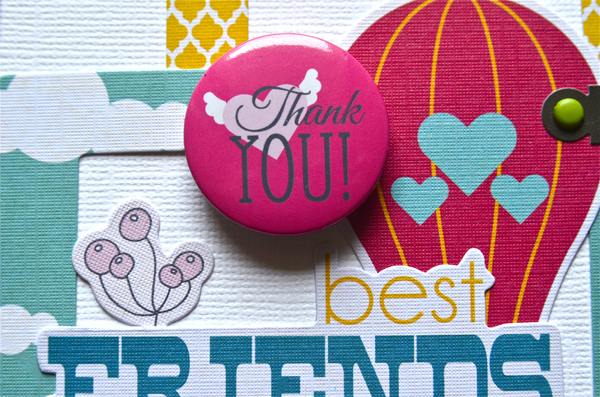 Love teh colours and the fabulous embellishments! Especially love the little banner about the Lisa is 50. Awesome double pager Lisa!! Love this one!! Beautiful two page layout! Happy Birthday (if it was recently). I love your pictures! Even MORE gorgeous layers! Great photos, too! Thanks for playing along with us at Challenge YOUrself! this page is so bright and happy!